I know I know...update the Blog!!!! This has been one of the best Months I've had! Thank you to all that have booked a wade or drift boat trip! The cooler nights are a welcome relief, to all species in this part of Ontario. The Upper Saugeen has very little water, can't imagine how the Brookies are surviving in this drought. The Rocky Saugeen, with it's heavy tree cover, has been at better temps but I will not fish the River until the water cools. Val and I often make a trip down the road to let Sulfur cool down and do some fishing on her own...(mostly for frogs). We have seen Trico's, Olives and Mahogany dunns, with some trout feeding very close to dark. The Grand's trico hatch has started, but be ready to be on the river in the dark. We fished it today (Aug 20) with dunns and emergers in the early hours, then to spinners after 9:00 am. Some good fish rising, but nothing huge. It's challenging fishing at best and a lot of fun. The Notty is still very low, running at 70 degrees, we really need some rain! The cooler nights might start bringing in more fish. 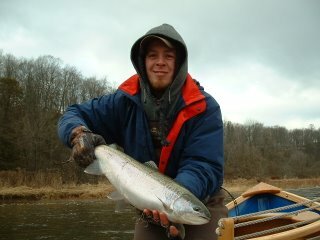 Lets hope for larger Salmon this year! I'll be out for the next 3 days, I'll post a report early next week. I'm Drifting for smallmouth and muskie and am sure we'll have a good week. 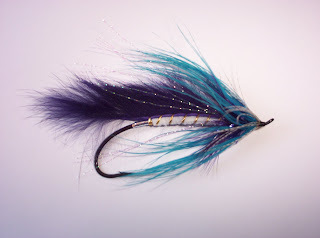 Tired of fishing low water for picky trout?? Why not give me a call and try some hard fighting smallies. The Saugeen is fishing great!! John booked a full day on the Saugeen to try these hard fighting fish,and after a slow start he was into some great fish!! John has asked I no longer call him my "Poster Child" so I'll just call him the best student I've ever had. Completely focused and determined to get the most out of his time angling. I truly enjoy his company and willingness to learn. It's a pleasure to have John in my boat. Thanks again John,see you in the fall!! It's time for Hex's on the Saugeen. 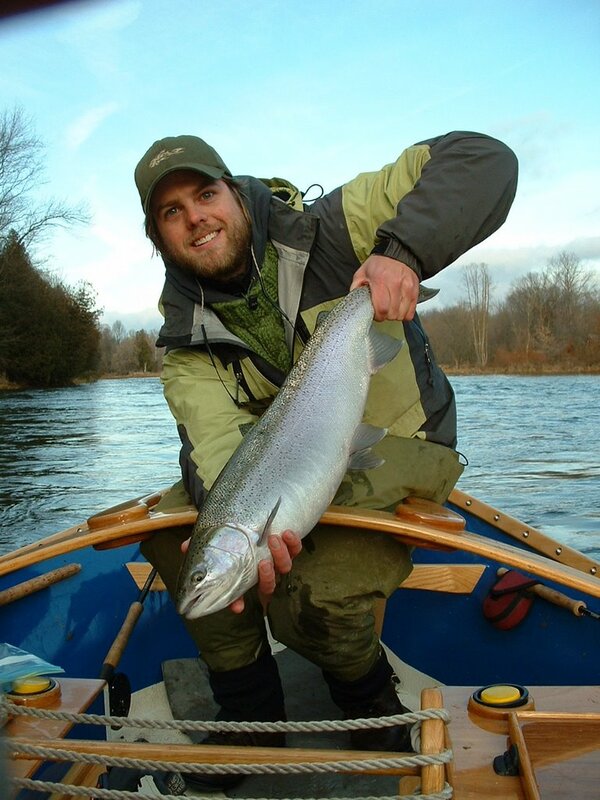 If you have yet to experience this hatch on the Saugeen now is the time!! The lower sections are getting good emergence and spinner falls,with smallies keying into these good sized meaty flies. 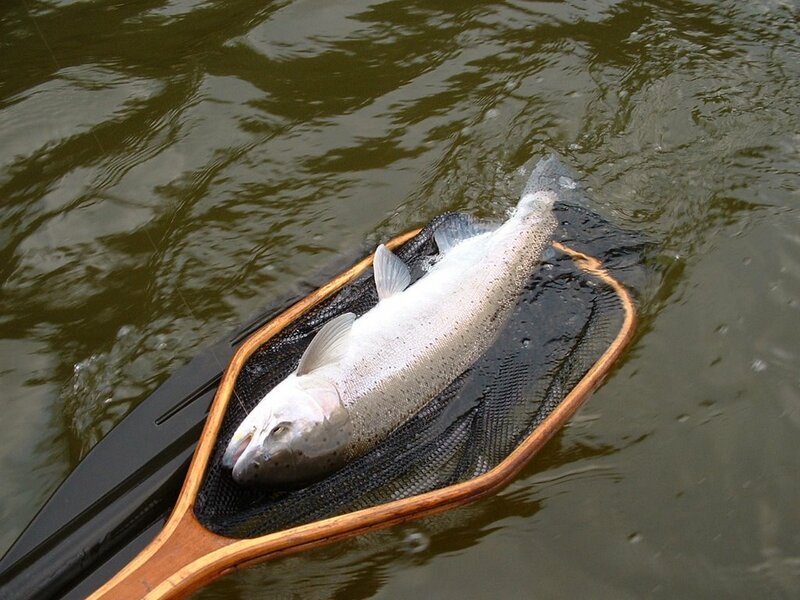 This is an evening thing,but well worth booking a drift boat trip for dry fly action. 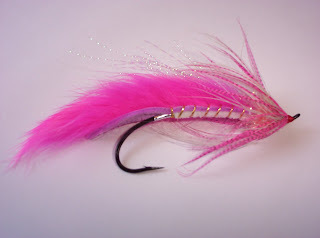 I have not been On any Trout waters.With this heat, I'm sure temps are beyond what I will subject clients and fish to. The Trout Creeks in my area are very low and warm,not worth wetting a line. The Rocky Saugeen is beyond fishing temps. It's all bass, bass,bass, not a bad trade off!!! I have limited dates open,call today to book your trip!! The new season is just around the corner,you should be thinking about Father's Day and Valentines day for a Fly-Fishing adventure. I now have gift certificates available through the web site. All you need to do is email me(ken@ontariodriftboatguides.com). I'll suggest an Adventure that will suite the needs of the person you want to enjoy the Adventure. I require a 50% deposit for the booking,balance due 7 days prior to the booking date. I'll mail you a receipt for the deposit. It's a new year and I'm looking forward to having a great year. but fresh fish continue to move in the rivers.I can't believe the amout of big fish that have been entering the Rivers this year. This has truly been a fantastic year for Steelheading. Enjoy,and don't be fooled we still have lots of rivers to fish. Why not give me a call and work off some of the "Christmas Cheer"